Kolkata, Nov 21: Former India captain Sourav Ganguly on Monday did not want to compare Virat Kohli with batting great Sachin Tendulkar, saying the current team captain will score many more hundreds like the one at Eden Gardens against Sri Lanka on Monday. 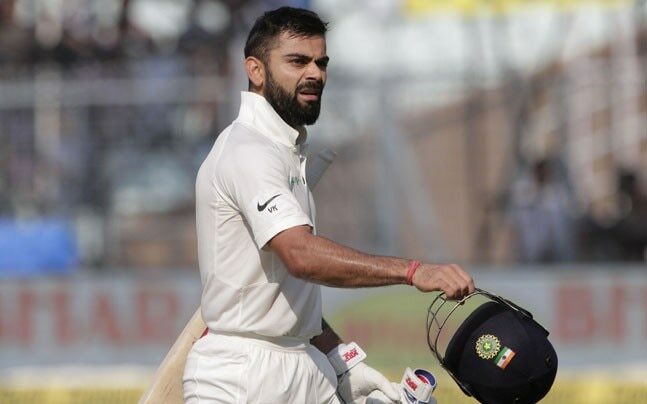 Kohli was not out on 104 off 119 balls in the second innings helping India post 352/8 decl. and set Sri Lanka a 231-run target. They were close to winning the tie with Sri Lanka on the mat for 75/7 before bad light stopped fifth day's play. This was Kohli's 50th international hundred -- 18th in Tests, 11th as skipper, and the first at the hallowed ground. Tendulkar has 100 hundreds to his name. "It's too early to compare him with Sachin. He still has to make 50 more centuries. But the way he is going, he will make many more such hundreds," Ganguly told reporters at close of play here. Kohli is also the fastest to reach 50 international hundreds. Asked if India could have declared a little early, Ganguly said: "India needed to be in a comfortable position to declare They did the right thing." Indian pacers took all 17 wickets, the most by quicks in a Test match, and Ganguly lauded their efforts. Bhuvneshwar Kumar, who was adjudged Man-of-the-Match, took career-best 8/96 while Mohammed Shami returned match figures of 6/134. "The bowlers bowled well. They got help from the wicket and made the mot of it. Bhuvi and Shami were brilliant," Ganguly added.